1. Remove cartridge label. Locate the vent holes on the top of cartridge. 2. Attach needle to syringe and load syringe with ink. Use the small drill to enlarge in the hole. 4. Clean off top of cartridge, un-tape the next fill hole and tape over the one just filled. 5. Repeat steps until all colors have been filled. Place scotch tape over the top of the cartridge so it covers every hole. Use a pin and put a small hole (vent hole) through the scotch tape for each hole on the top of the cartridge. 6. Clean off the cartridge. Re-insert the plugs. 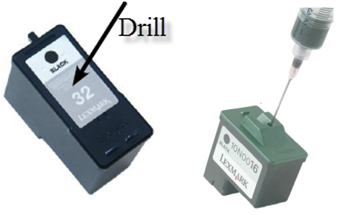 If your Lexmark printer does not recognize your refilled cartridge, there is a step you can TRY. It may work for some printers, and may not work for other printers, just give this step a try. Place a piece of transparent tape (or electrical tape) and cover just the left row of the golden chips on the front of your cartridge (as shown below). After procedure, the printer will ask you to do an "alignment check", please select "cancel". In your computer's printer settings, it will show the ink level blank with a question mark in a red triangle. Don't be worried, the printer should still print. And, after a while of printing, if you see any fading of ink on your paper, it is time to fill the cartridge with ink again.